Today we're rolling out Beta 3 of Android P, our next milestone in this year's Android P developer preview. With the developer APIs already finalized in the previous update, Beta 3 now takes us very close to what you'll see in the final version of Android P, due later this summer. Android P Beta 3 includes the latest bug fixes and optimizations for stability and polish, together with the July 2018 security updates. It's a great way to test your apps now to make sure they are ready before the final release. Give Beta 3 a try and let us know what you think! You can get Android P Beta 3 on Pixel devices by enrolling here. If you're already enrolled and received the Android P Beta 2 on your Pixel device, you'll automatically get the update to Beta 3. Partners who are participating in the Android P Beta program will also be updating their devices to Beta 3 over the coming weeks. Today's preview update includes the Beta 3 system images for Pixel devices and the Android Emulator, as well as an update to the Android Studio build tools to include D8 as an independent tool. Beta 3 is an early release candidate build of Android with near-final system behaviors and the official Android P APIs (API level 28). 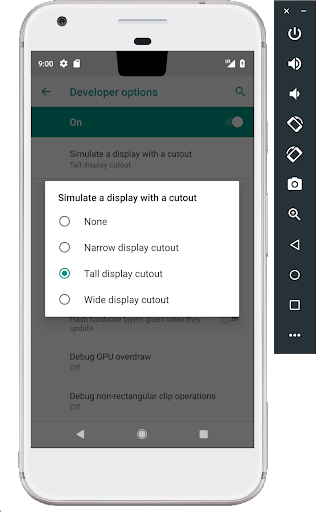 With the Beta 3 system images and updated build tools, you've got everything you need to test your apps or extend them with Android P features like multi-camera support, display cutout, enhanced notifications, ImageDecoder, TextClassifier, and many others. In your testing, make sure to account for App standby buckets, privacy restrictions, and restrictions on non-SDK interfaces. First, make your app compatible and give your users a seamless transition to Android P. Just install your current app from Google Play on an Android P Beta device or emulator and test -- the app should run and look great, and handle the Android P behavior changes properly. After you've made any necessary updates, we recommend publishing to Google Play right away without changing the app's platform targeting. If you don't have a supported device, remember that you can instead set up an Android Virtual Device on the Android Emulator for your test environment. If you haven't tried the emulator recently, you'll find that it's incredibly fast, boots in under 6 seconds, and even lets you model next-gen screens -- such as long screens and screens with a display cutout. Next, update your app's targetSdkVersion to 28 as soon as possible, so Android P users of your app can benefit from the platform's latest security, performance, and stability features. If your app is already targeting API 26+ in line with Google Play's upcoming policies, then changing to target API 28 should be a small jump. When you change your targeting, make sure your app supports all of the applicable behavior changes. It's also important to test your apps for uses of non-SDK interfaces and reduce your reliance on them. As noted recently, Android P restricts access to selected non-SDK interfaces. Watch for logcat warnings that highlight direct uses of restricted non-SDK interfaces and try the new StrictMode method detectNonSdkApiUsage() to catch accesses programmatically. Where possible, you should move to using public equivalents from the Android SDK or NDK. If there's no public API that meets your use-case, please let us know. When you're ready, dive into Android P and learn about the new features and APIs that you can use in your apps. To build with the new APIs, just download the official API 28 SDK and tools into Android Studio 3.1, or use the latest version of Android Studio 3.2. Then update your project's compileSdkVersion and targetSdkVersion to API 28. Visit the Developer Preview site for details and documentation. Also check out this video and the Google I/O Android playlist for more on what's new in Android P for developers. As soon as you're ready, publish your APK updates that are compiled against, or optionally targeting, API 28. Publishing an update to Google Play during the preview lets you push updates to existing users to test compatibility on their devices. To make sure that your updated app runs well on Android P as well as older versions, a common strategy is to use Google Play's beta testing feature. With beta testing you can get early feedback from a small group of users -- including Beta 3 users � and then do a staged rollout to production. Thanks for all of your feedback so far. Please continue to share feedback or requests as we work towards the consumer release later this summer. Feel free to use our hotlists for platform issues, app compatibility issues, and third-party SDK issues. Also, the Android engineering team will host a Reddit AMA on r/androiddev to answer your technical questions about Android P on July 19 from 11:30-1 PM (Pacific Time). Look out for an announcement on r/androiddev in the coming weeks. We look forward to addressing your questions!